You don’t need to be a nutritionist to realize that vegetables and fruits are rich in numerous nutrients that can make you healthy and free from diseases. I know a lot of people who would want to try a healthy lifestyle and eat more veggies and fruits, but they’re not exactly fond of slicing and cutting these foods. If you’re one of them, then I suggest you look into the possibility of getting a salad shooter. Also known as a salad maker, it’s a kind of food processor that can cut and slice fruits and vegetables. This could be the kind of kitchen apparatus that you should have so you can easily prepare nutritious meals. What can you do with a salad shooter? What to look for in a salad shooter? 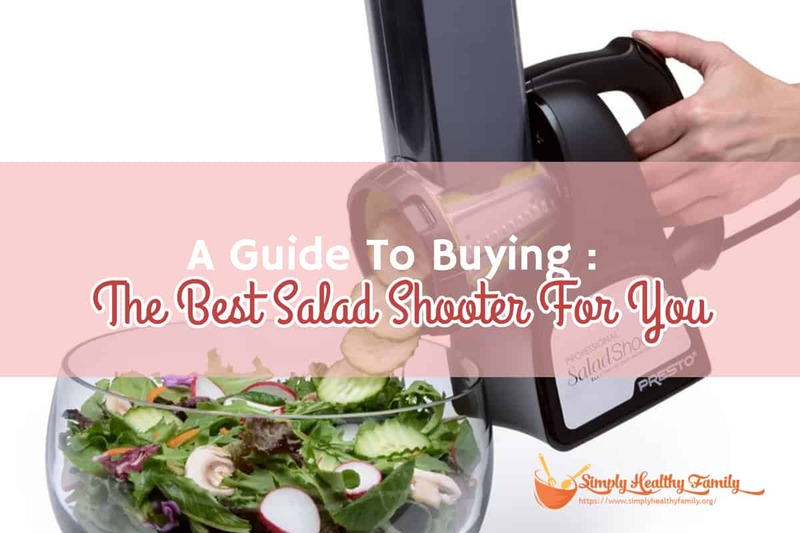 Now that you have an idea on what a salad shooter is and how to pick the right one for you, let’s take a closer look at five of the top rated salad shooters today. This is an electric salad shooter that has two interchangeable cones and sharp blades made of stainless steel. 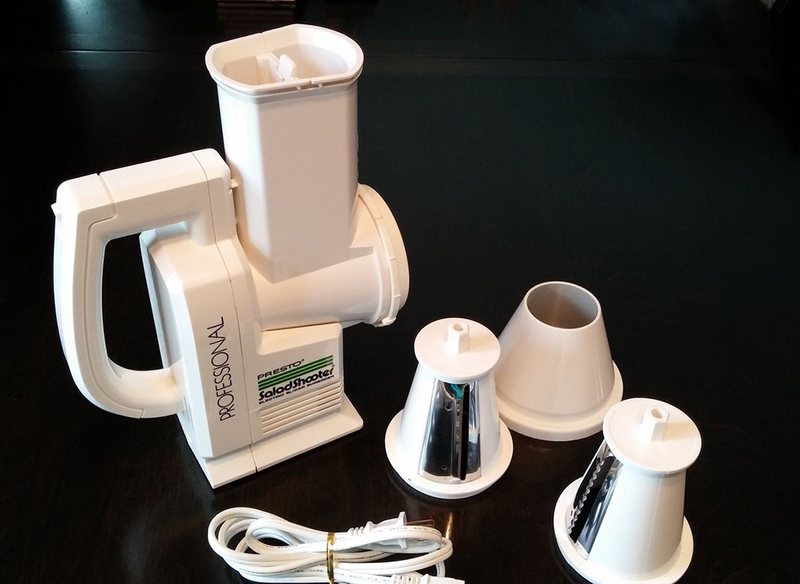 The cones are interchangeable-- one can be used for shredding while the other, for slicing. Both cones are secured by a twist-lock ring. This is a pretty simple salad shooter as there are no complicated parts for assembly. To use it, just flip the power switch on. Hold the handle and then press the food guide with one hand so that the unit will produce shredded or sliced food. Aside from being easy to use, it is also very easy to clean. You can simply wipe clean the motor base. Its parts are also dishwasher-safe. And when you’re done with it, you should have no problems storing it in the drawer. It is compact and thus easy to store. You can shoot ingredients wherever you want, without any extra bowls to clean. Besides vegetables, this shooter can also used to grate chocolate, chop nuts, or crush bread and cracker easily. This is another salad maker that doesn’t take up a lot of space in the kitchen and performs admirably for its size. It measures 9.1 inches long, 6.3 inches wide and 11.1 inches tall. It weighs about 4 pounds. It is easy to operate with a one-touch button. 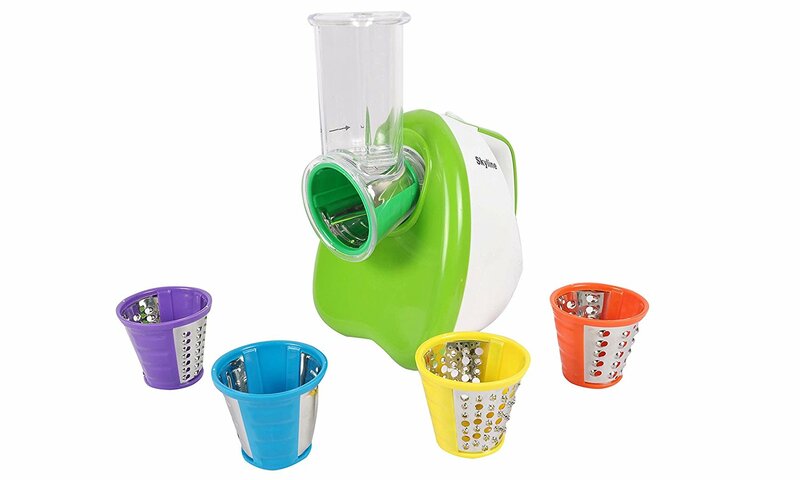 It comes with five stainless steel cones that you can use for grating, slicing and grinding food. The slicers are very sharp and can cut foods very evenly. Just make sure that you insert fresh and crunchy foods because there is a tendency for soft veggies and fruits like cucumber to get stuck in between the slicers, which can be quite difficult to remove. And just what you would want from a salad maker, this unit is really easy to clean and store. This electric salad shooter features a 150-watt motor that can help you in slicing and grinding food. It is easy to use, too, with a one-touch button control that is designed to make the unit a breeze to operate. Cleaning this unit won’t take a lot of your time. Simply wipe the motor base with a damp cloth. All of its parts are also dishwasher safe. And with a compact design (6.8 inches long, 6 inches wide and 7.5 inches tall), you should have no troubles storing this unit. What I love the most about this salad shooter is its big food chamber. The opening is wide enough to accommodate foods like whole potatoes and zucchinis. I really don’t mind that it is slightly bigger than most of the salad shooters in this list. It measures 20 inches long, 8 inches wide and 14 inches tall. Aside from the wide food chamber, this unit has an adjustable food guide that can easily adapt to large and small loads. It also has interchangeable processing cones, including a ripple chip cone that you can use for producing thin ripple chips. Of course, this salad shooter has its shares of flaws as well. I mentioned earlier that it isn’t the most compact of units. Aside from its odd shape, it is also a bit noisy. Rounding out our list is this excellent salad shooter from Presto. This electric slicer/shooter comes with a handy funnel guide that you can turn to in directing foods into the machine. There’s also an adjustable food guide that can easily adapt to small or large loads. The unit also includes processing cones that are interchangeable and useful in making slices, cuts, and shreds. Like the item preceding it, the Presto 02970 features a large food chamber where you can insert whole potatoes and other big vegetables. The Presto 02970 doesn’t have the most powerful motor, but it offers sufficient power to slice all sorts of fruits and vegetables. It is relatively compact too, measuring 8.5 x 4.2 x 11 inches. I don’t think you will have any problems storing this salad shooter given its size. The Presto 02970 is also easy to clean with its parts being dishwasher safe. The base of the unit can also be wiped with a damp cloth. This unit comes with a one-year limited warranty. Salad preparation can be very tedious especially for an ordinary Joe. But with a salad shooter, you can prepare salads faster and easier. You don’t have to chop, grate, slice or shred fruits and vegetables. You can also chop and slice cheese with a salad shooter. You can also grate cheese for pizza, whether it is mozzarella cheese or parmesan cheese. You can also make bread crumbs using a salad shooter. And you can make potato salad in an instant with this apparatus. A salad shooter is highly recommended to busy bees like professionals and even homemakers. You can save a lot of time and energy when you have a salad maker at home. The ideal salad shooter is one that can be used right out of the box. If it is to be assembled, there should be a few parts in the package. A salad shooter should be a handy device and not a complicated apparatus. Look for a salad shooter that is easy to use. I suggest you get one with a one-button operation if you like an electric salad shooter. Cutting devices are very prone to bits of fruits and vegetables getting lodged in awkward spaces or parts such as the motor. Thus, it is important that you get a salad shooter that’s easy to clean. The salad shooter must not only be compact and lightweight; it should also be able to hold a large amount of food in one get-go. This would let you to quickly chop your items. Most salad shooters are made of plastic. The premium ones are made of stainless steel, although you need to shell out more for them. Finally, this could be the most important factor to consider for most shoppers. A good salad shooter should be able to cut sharply in no time. The slices must also be even. Cutting cones that can let you chop foods into various shapes may also affect your buying decision. Some of the cones you’ll likely come across with are slicing, grinding and coarse grating cones. Like in buying any other tool, look for a salad shooter that has at least a one-year warranty. Some electric salad shooters are notorious for being noisy, which can be annoying for some homemakers. These are all good choices if you are shopping for a salad shooter. But what's my pick, you might wonder. I'll have to go with the Presto 02970 Professional Salad Shooter. While it has its share of flaws, I feel that it has the right combination of size, function, and ease of use. It may not have the most powerful motor, but it can do its job good enough for most people.